Lorenzo Gaz is an Atlanta-based realistic abstract artist who winters in Puerto Vallarta and was encouraged to become an artist later in life by a close relative, David Gaz, the internationally recognized photographer and film producer. The above photo was taken in his Puerto Vallarta studio that faces the oceanfront (Bay of Banderas/Pacific Ocean) to the West and the surrounding mountains to the East. Gaz is in his sixth career following successful careers in Corporate America, as an entrepreneur, and most recently a university educator. 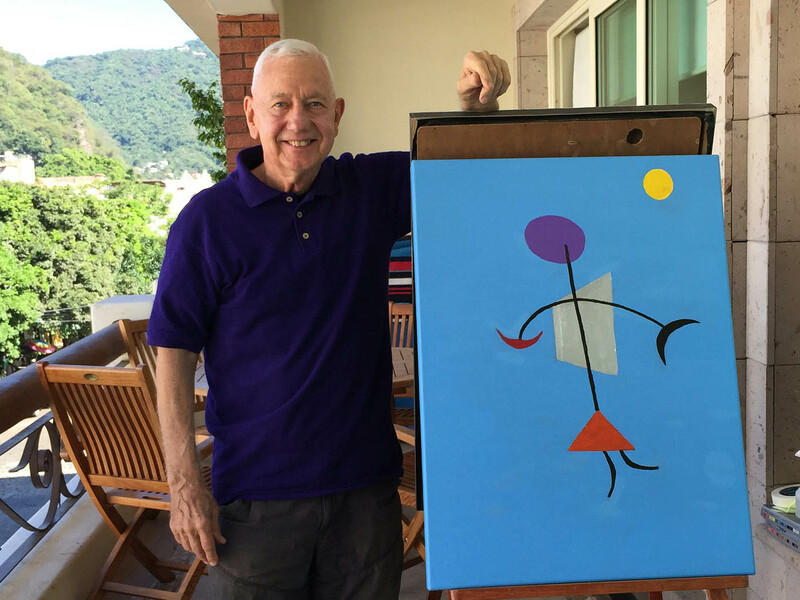 His crisp and brightly colored acrylic paintings capture many familiar icons in Puerto Vallarta, mimic Miro, Munch and other well-known artists of the 19th and 20th century as well as bring to life Street Art from Spain and Mexico. He donates his paintings to various charity auctions in Mexico and the metro-Atlanta area with 100% of the proceeds going to the charity. He envisions his legacy as uplifting residents and visitors around the world by painting street art (grafiti callejero) of his dynamic, whimsical and smiling “happy folks” (la gente feliz) series on otherwise unattractive and mundane spaces in major cities. Among other honors, his signature image, El Amante Feliz (The Happy Lover) was selected in 2018 by the Art-on-the-Atlanta-BeltLine committee to be included in their permanent collection of murals and is promenently located on the Western entrance to the Lee-Murphy Tunnel. See MY ART to view mural, and PRESS and PUBLICATIONS section for more details. His art often mimics recognizable icons in Mexico, street art around the world, classic styles or famous works of art. For his BeltLine mural, Gaz was inspired by a single example of heart-shaped graffiti crudely spray-painted on a metal retractable curtain protecting a plate-glass window on his 2017 visit to Barcelona. In his mural, the central subject, a heart, the embedded word (LOVE) and the environmental color of green are all designed to evoke an emotional reaction within each visitor in a way, hopefully, they feel their life is better at that particular moment. In addition to art, his many interests include photographing Graffiti Callejero (street art) around the world, learning Spanish, playing duplicate bridge and teaching the game of bridge to middle school students as a means of developing and enhancing their STEM (science, technology, engineering and mathematics) skills and attracting under-represented groups, particularly women, into STEM careers. To View Each Section, touch or click on the 3 parallel lines in upper right corner of page, and to View Entire Image and Details on MY ART webpages, simply touch or click on Title below photo, then full image along with details of each piece will be displayed. Lorenzo Gaz © 2018 All Rights Reserved.